Having profiled a 1959 Imperial sedan from one of the wildest-looking years of Chrysler’s Forward Look era, it will be interesting to contrast it with a car of the same make and model, and even in almost exactly the same color and condition, from five years later. This 1964 Imperial sedan, spotted in the car hobby mecca of Carlisle, Pennsylvania, shares almost everything with its 1959 predecessor except for its exterior styling. The difference in style is so extreme that it is difficult to believe that they are essentially the same car beneath their sheet metal. 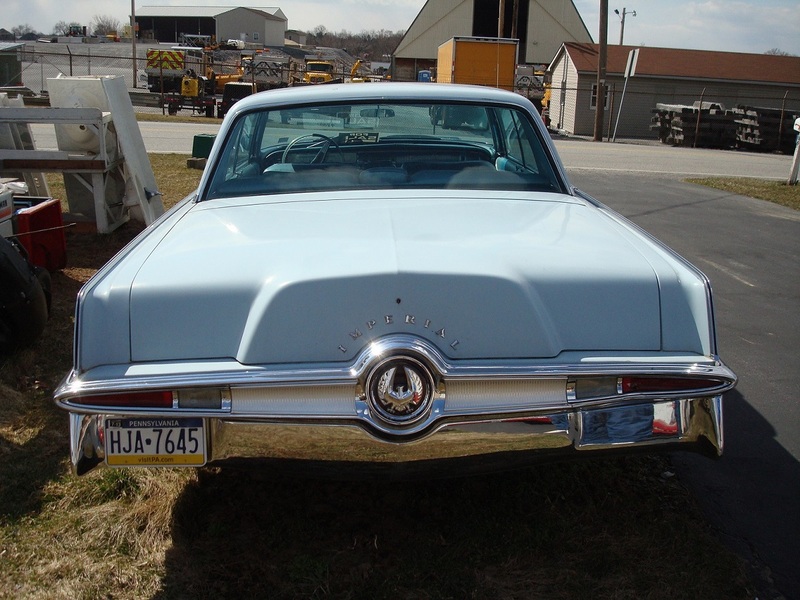 The 1964 Imperial was the first complete restyling of Chrysler’s flagship conducted by Elwood Engel, the stylist of the 1961 Lincoln Continental, after Chrysler hired him from Ford in 1961. On the same chassis and body structure introduced in 1957, as evidenced by the continuation of the 1950s-style wraparound windshield that was long out of fashion in Detroit by 1964, Engel placed a completely new body style obviously derived from his earlier work on the Continental, with slab sides, bladed fenders, a squared-off roofline, and a similarly shaped inset hood. Bringing Imperial finally in line with the contemporary trend in styling that started with the 1961 Lincoln Continental and that Cadillac emulated by 1963, the restyling was a success, with Imperial sales soaring by 65% to 23,295 — the first Imperial model year over 20,000 since 1957, and the best year of the 1960s for Imperial. The restyling extended to the interior, which left behind the squared-off steering wheels and instrument panel pods of the early 1960s and reinstated more conservative normalcy, with a round steering wheel and a simple and elegant instrument panel. It continued earlier practice with extensive instrumentation and pushbutton transmission controls — the latter in their final year. The pushbuttons controlled the same 413 Wedge/Torqueflite combination that had powered Imperials since 1959. The 1964 restyling modernized the look of Imperials and was a sales success, but in retrospect, it was only a partial success. After the 1964 uptick in sales, they fell below 20,000 again in 1965 and did not climb above it for the remainder of the decade. Part of the reason may be that the new styling direction was so heavily imitative of the Continental, and that where it differed, such as in its rear view, the results were less harmonious than the original. Neither the 1964 restyling nor the completely new chassis and body of 1967 established a distinct look for Imperial, which could have helped Imperial to revive its fortunes as the 1961 Continental had done for Lincoln. As a half century old classic car, the 1964 is similarly uninspiring for me, a decently styled big cruiser but not really distinctive in any way. Given a choice between a light blue 1964 Imperial sedan and a light blue 1959 Imperial sedan in the same condition, I would take the latter. This is perhaps not the best color for this car. Yes, it’s a nice color, but think of this car in, say, dark green, dark red or dark blue. It makes for a very classy statement. Furthermore, I like this design since it emphasizes the squared off and modern looking greenhouse; the 1959’s styling overshadows this very redeeming element of a crazy looking design (primarily at the rear). I like the earlier Imperial, but prefer this car. Thank you–I’ve been quite busy but can’t seem to stay away from CC. I agree with you about color, a close friend has a ’65 in a deep maroon and it’s quite the looker. That blue is just “meh”… heck, it wouldn’t look good on much of anything except maybe a Beetle. Agreed, I was thinking that this was definitely a ‘small car’ color. And Granny can ride in her rocker. I’ve seen one in a sort of gold or bronze color (I’m not sure if it was an original ’64 color, although it does seem of the right general vintage), which was not an improvement. I love the color! and the tendency for a lot of car company’s using pale colors and countless combinations in those days great times! This example looks quite well intact and would be a great show or cruiser car demanding a lot of attention where ever it sailed into port. To me, this car says “1964” the way the other car for today says “1959”. Each is a product of its era. By 1964, the wild diversity was gone and all 3 luxury cars were shaped pretty much the same, differing only in details and overall flavor. Each has the distinct atmosphere of its manufacturer. As a former owner of a 64 Crown Coupe, I can attest that the Imperial was just dripping with “Chrysler-ness” in a way that gives it a lot of character. Pushbuttons, the thick-rimmed steering wheel, and the hundreds of pounds of plated diecastings both inside and out make this car ooze with personality. So, I could go either 1964 or 1959, just depends on my mood. Another reason why Imperial sales probably fell for 1965 was that the new Engel-styled Chryslers came out for 1965. They looked a lot like the Imperial, even nicer in some respects. Ahh yes, like a New Yorker 4 door hardtop in Black with silver accents and Those cool transparent clear Taillights. Wow – I’m virtually certain that this is this car was originally owned by someone in my hometown, which is located less than 20 miles from Carlisle, Pa. In the early 1980s I worked at a small, family-owned store in Shippensburg, Pa., that sold school supplies, magazines, greeting cards, candy, cigarettes and Pennsylvania Lottery tickets. This car regularly pulled up right outside the front door of the store. The driver was a 50-something woman who still wore her reddish hair in a heavily lacquered, Jackie Kennedy-style bouffant. I still remember her name (and I’m almost certain that she is now deceased). She also wore a fur coat during the winter months, but in a style that most definitely was not contemporary. This car was her daily driver. Even in the early 1980s, this Imperial really stood out in our small town. So, for that matter, did the driver’s hairstyle. They were both throwbacks to the mid-1960s. The front-wheel-drive revolution was in full swing even in our small town. I always wondered if this car’s interior reeked of cigarette smoke, as every time the store had a promotion on a carton of cigarettes, she would rush in and buy as many as she could – regardless of the brand! She would carry out four or five cartons of cigarettes at a time to this car. I left town to attend college in Philadelphia in the fall of 1984. Sometime in the late 1980s, this car showed up on the lot of the Shippensburg Chevrolet-Oldsmobile-Cadillac dealer (which is still in business and has been owned by the same family since it began operation). I guessed that the driver died (most likely of lung cancer). If I recall correctly, her house, which was located just around the corner from my parents’ house, went up for sale at the same time, too. The car was immaculate then, although I don’t believe that it featured these seat covers, which look like replacements. I’m almost certain that the chrome was original and that she had never had the car repainted. Thanks for the fascinating history of this car! It almost ended up being mine, because despite my mild criticism of its styling, it was a very interesting car in remarkably good condition. I was seriously tempted to call the number on the For Sale sign and possibly make an offer for the car, but I did not because I took out a tape measure and found that there was no way that the car would fit into my garage. I found that my 1986-built house had a garage that would just barely fit a 1980s downsized full size car, and nothing longer — no doubt intentionally by design. The garage of my parents’ 1975-built house would have easily contained a pre-downsizing car. I did not measure before I bought mine. I had a pre-WWII garage with a 3 foot doghouse-style extension out of the back which BARELY contained the car. I mean by less than an inch. You’re welcome. I googled the driver’s name, and found the grave of someone with her name in the main cemetery of Shippensburg. That grave is most likely the resting place of this car’s owner. According to her tombstone, she died in April 1991, which, in retrospect, fits as to about the time that I saw this car at H&H Chevrolet-Oldsmobile-Cadillac. Her husband had died in early 1982. That also fits, as I never saw her with a man when I worked at that family-owned store (which was from September 1982 through September 1984). That also means that she was apparently buying all of those cigarettes for herself! With this Imperial, her hairstyle, and her style of dress, it was as though she had traveled through a time warp from 1965 to 1983. Each year of the Imperial in the ’60 through ’63 period had at least some weird elements. The square steering wheel being the topper. The ’64 did away with weirdness, and foreshadows the general spirit of the ’65 full-size Mopars quite extensively – a couple of the elements in its relative success. Unfortunately for this car, it also looks a bit like a design study for ’65 that was discarded when you look at the rest of the ’65 line up. The proportions have always seemed a little off to me, especially the C pillar / rear door glass. The coupes always looked a little off as well. 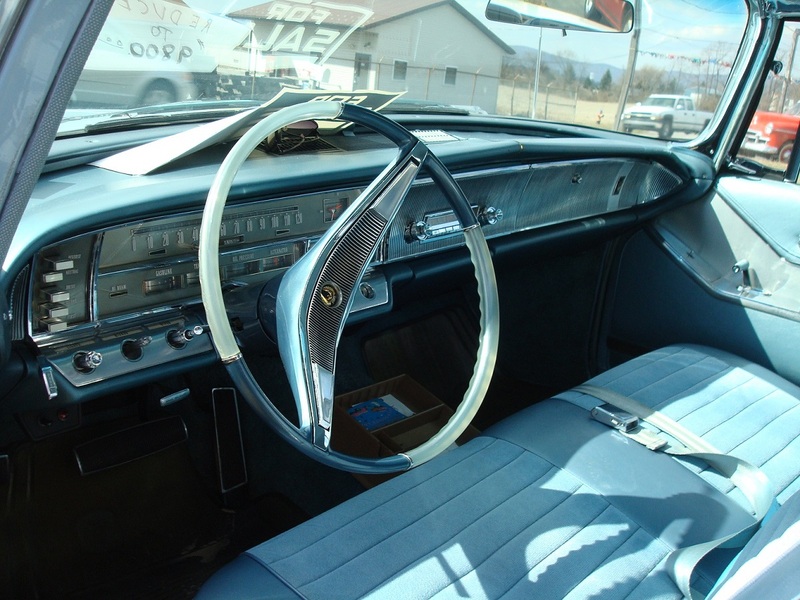 The dash, while beautiful, was instantly outdated by the rest of the ’65 Mopars. The rear end is also just a bit off, and I believe that the smallish tail lights were criticized for minimal light output and vulnerable design. The similar ’65 version of this car had to sit in showrooms with the beautiful ’65 New Yorkers, 300s, Newports and even Furys – all of which were better sorted out designs and more modern in most respects. That left Imperial in a tough spot for both ’65 and ’66. The ’67 Imperial is a great looker in a conservative ’60s way, and looks like the car that should have been introduced in ’64 – which made it seem a bit dated when it arrived late to the party. 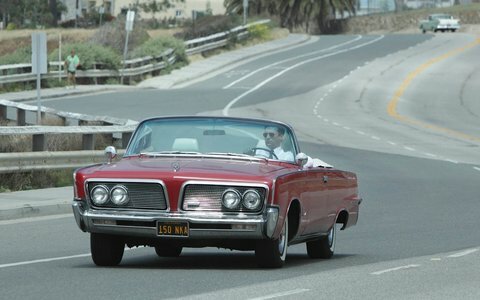 The featured car, while very cool, really should be been introduced in 1961 – which of course, Lincoln did. I think the C pillar was a bit of a compromise, as it had to work with both the 2 door and the 4 door. Lincoln only had to make it work with a 4 door, and Cadillac had enough money to to multiple roofs. As a result, I see your point – that roof works pretty well with the 4 door, pretty well with the 2 door, but is not a grand slam on either. A dark color or a vinyl roof helps these quite a bit, though. Knowing that you owned one, and also being a person that really likes this car just for its “Chrysler-ness” as well, I hated to go on the tangent I did. But, the second year of this design more or less flopped in the market in 1965, a year when cars were selling themselves in record numbers. There has to be some explanation – redesigned loaded New Yorker hardtops probably being part of it. I’m a bit of a heretic when it comes to the ’61 Continental. It has the same C pillar / rear door window proportions as the ’64 Imperial – I wonder why 😉 . I always thought that the Continental suffered from its relatively short 123″ wheelbase, and my opinion is that the ’64 Continental represents the best of the early ’60s Lincolns – the stretch to a 126″ wheelbase brought a longer rear door window that improved exterior proportions and rear seat leg room. (My true heresy is that I think the ’65 Lincoln restyle perfected the concept). The ’64 Imperial is a hard one to figure, it has a 129″ wheelbase, yet has that ’61 Lincoln look – and they did it on purpose. That five degree forward tilt of the back edge of the rear door says it all. Chrysler’s intelligence must have misread Lincoln’s plans for ’64. Like you say, the tie in to the coupe brought some compromises. I kind of agree with you. As much as I liked my Crown Coupe, I will admit that the roof was a tad awkward. For pure aesthetics, I always thought these looked better as a 4 door or a convertible. Agree that these were not as well received in the marketplace as Chrysler would have hoped. There were quite a few touches on my 64 that made the car feel older than it was – the windshield, the pull-out exterior door handles, those dash-top a/c vents, and several other things. The 64 was introduced to competition (other than Lincoln) that was at the tail end of a design cycle. 1965 brought a beautiful Continental, a brand new Cadillac, and a brand new New Yorker. We could also say that the 64 was an aberration, because Imperial sales had stayed in a narrow range pretty much every year. Who knows how many of the 64s sold to dedicated Imp buyers who traded their 62s and 63s earlier than normal to get into something that looked newer. And 20K 1964 units was not a blowout success anywhere outside of Imperial-Land. 5K 1964 Crown Coupes was a mighty puny showing compared to the Coupe DeVille. Obviously these were going to sell in much smaller numbers, but considering that they tooled up 5 or 6 different roofs for the 65 C bodies, you would think they could have managed 2 for the Imperial? You are right — the color and the convertible body style completely change the character of the car. In a darker color, the front end looks much bolder, and the lack of a roof addresses the only problems that I have with the car’s styling. The only parts of the sedan that don’t look quite right, in my opinion, are the C-pillar and the tail, and the convertible gets rid of the C-pillar and would probably make the trapezoidal tail look better too. Agree on the color. I like the idea of having baby blue available for those who might like it, but I don’t much care for it myself. But it was certainly a perennial from the early 50s until well into the 80s – Ford was still offering it on the Crown Vic in 1985. When my father was pondering the order for a 78 Town Coupe, he was flipping through the color and trim book in the dealer and lit on the idea of a baby blue car with tan leather interior. Everyone else in the family thought it was a horrible idea, and he finally came around, at the cost of (yet) another white car. When I was a kid, my favorite Imperials were also of those years, the ’62s and 63s. 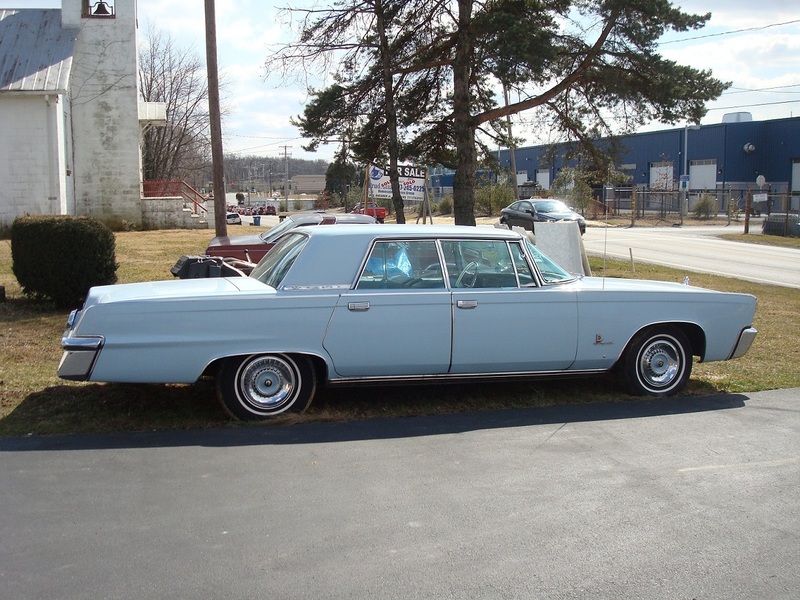 With these ’64s came the “Lincoln Imperials”, and I did not like them. However, recently I have come to appreciate their relative tastefullness compared to the earlier years. Engel didn’t come aboard at Chrysler until 1961, and the 62 Imp would likely have been in production by the summer of 1961, so I doubt that there was time for him to have any input on the 62 Imp. From what I have read, Exner oversaw the de-finning of the cars, but very reluctantly. Orders were coming from higher-ups that the fins had to go. I think it was really 1964 before anything showed up in a showroom with any significant Engel involvement, other than possibly a few minor 1963 trim details. An article on Virgil Exner in the old Automobile Quarterly noted that a Texas Chrysler-Plymouth dealer was removing the fins from brand-new 1961 Imperials with a hacksaw, filling the resulting hole with a chrome casting, and selling the cars. That was about the only way he could sell the Imperials! I’d also read that, in 1961, a group of Chrysler-Plymouth and Dodge dealers protested directly to corporate headquarters regarding the wacky styling of the corporation’s cars. Little did they know that things would get worse for the 1962 model year. I once went to look at a Connie Mark III for sale. The owner was a cool old guy who had been pretty successful. We hit it off and I spent some time talking to him. He had been a Chrysler guy and bought a new 61 300G, then took it to a body shop that customized it by shaving the fins off. He showed me some pictures of it. It was not as well finished in the rear as the 62 Chryslers, but not bad for a custom job. He traded it on a 64 or 65 Imperial, which he tried to trade on a new late 68 Mark III. He told me that the Lincoln dealer refused to take the Imperial in trade. I think I’ve seen pictures of that 300G with the fins cut off. Sacrelige! The Nelson Institute For Marine Research staff cars were ’64 Imperial 4 doors. And Admiral Nelson (played by the great Richard Basehart) drove an exquisite 1965 Imperial Crown convertible. Voyage To The Bottom Of The Sea, another 60’s classic! Personally, I much prefer the 64 over the 59. I remember that one! It was an AMT “annual”, but you had to cut open the model from the rear seat to the trunk to make the pick up bed and interior fit in.Nice model, fairly valuable today, if you can find one. I have one of those. Unbuilt in the original box. It’s a 1965, not a 64. I really wanted a Jo-han 1966 Chrysler 300, but the seller also had that one so I made a deal for both. I had the pickup truck model kit back in the day. I sliced the hell out of my hand carving the back with a razor blade. i remember the plastic had a score mark on the underside to follow. I also had a kit to make the Black Beauty. My mom gave me both of those kits so i have a hunch they must have been in some kind of bargain bin half price deal. Imp models were probably not popular. I like the 1959 more. It’s more outspoken, but that’s a good thing. The 1964 appears to be plain. The front end is what really annoys me on them. The middle looks almost like a… Pontiac. The 1959 is crazy in the rear, but it screams “Luxury Car”. Looks pretty good for a car that was mechanically unchanged since 1957, but that wrap around windshield was just about as dated as the tailfins of the same year Caddys.This is probably the best looking Imp of the 60s, especially when one considers the too Chrysler like unit body ones of `67 and onwards.At least this Imp has its own identity. Epitomizes”big luxury”.Looks heavy and solid, but that front clip is too Pontiac like with the split grille. I always thought the 59 was the “inspiration” for the ….vehicle used by George Jetson on The Jetsons cartoon show. While the cars that followed it were more “restrained”….as most people in the 50s expected (late 50s Lincolns notwithstanding). Prefering a 2 door body style, I’d definitely go for a 64 Crown Coupe before I would look at a 59. And yes, in a dark color. BTW, ME TV runs The Green Hornet on weekend mornings. I don’t car for Brett Reed’s Chrysler convertible, but really prefer the D.A.’s 4 door hardtop…a New Yorker? My brother had that AMT model kit of the Imperial pickup, which was a ’66 if I recall. I do prefer the styling of the ’64 over the ’59. although I didn’t realize until recently that the windshield dated from the ’57 model. I would prefer a dark blue/burgundy or black for an exterior color. 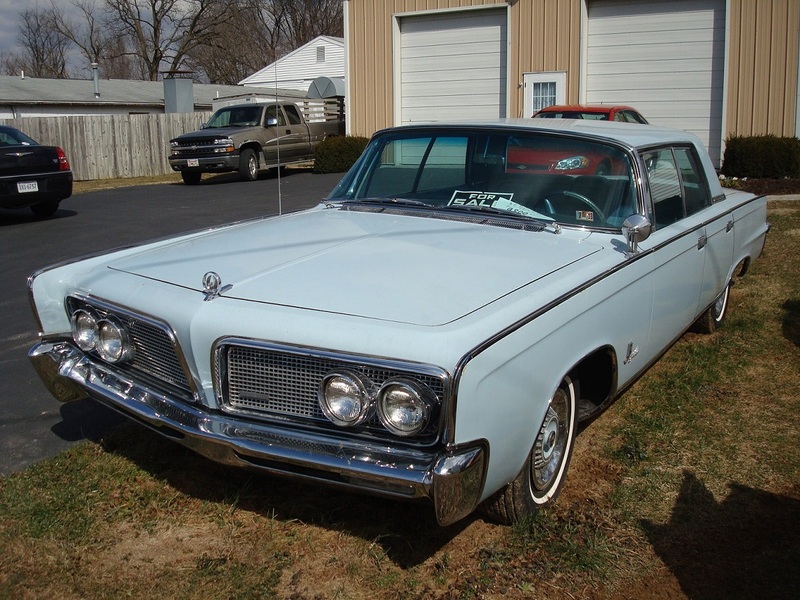 If it wasn’t for the ’64 Lincoln, I would like the ’64 Imperial a lot more. In every direction that the Imperial separated itself from Cadillac the Lincoln went one step further. The Continental had become a modern classic by this point and what’s worse is that the ’64 model tidied up the grille and rear finisher. The body style never looked more clean and elegant than it did in ’64. I like the ’64 Imperial a lot, especially as a 2-door. The cream-colored convertibles that they used in the Beverly Hillbillies looked stable, expensive and very impressive. I imagine that the ’66-67 Continental 2-doors made the Imperial 2-doors look old though. I love all Imperials prior to the 1980s sullying of the name. The big beasts intrigue me whether it is a late 50s model or a mid 70s last gasp of the Detroit Dinosaurs. Dark colors work best on all of them too. A carport in my area housed this same year car with dark metallic blue paint, the same blue interior, for decades. Never saw the car run & drive; but someone kept it washed off. The dark metallic blue paint did this car’s body lines justice; much more than the article car’s baby blue paint does. I never met an Imperial I didn’t like!! My mother had a 64 Imperial that was purchased in 1971. It was in very good condition and only had around 50,000 miles. We kept it for a couple of years, but the transmission went out, and it had started to rust around the rear wheels where it had been filled with bondo before we purchased it. I only got to drive it a couple of times (I didn’t have my license or permit yet) and it seemed massive to me especially as I drove it mainly on narrow country roads. I have always loved the style of this and I remember how comfortable it was to ride in, front and back. We had several Chrysler products as I was growing up, but they all had various transmission problems, and this was the last one we ever had. Count me as one who does not think this car works as to design. I suppose 70% of the design works, but the greenhouse does it in with that outdated windshield that doesn’t match up with the slab side glass. It just looks cobbled together. It’s as if Chrysler’s designers got as far as the front glass and their budget ran out. I’m guessing that this is exactly what happened. Chrysler was going through a rough patch when this car was under development. Changing the windshield was probably quite expensive, particularly since the Imperial was the only body-on-frame passenger car built by the corporation after 1959. Chrysler couldn’t spread the cost of a new body shell over 2-3 car lines. Note that the 1961 Lincoln Continental and Ford Thunderbird shared a windshield and cowl structure, and were built on the same assembly line. The Imperial body shell was woefully outdated by 1961, but given the low volume involved, Chrysler probably didn’t have that much money to really redo the car. Corners were thus cut whenever possible. Thanks, Robert Kim, for the story on this car. In a sort of “reverse” CC Effect, I was wondering the other day whatever became of this car. Now I know that it never left the area. As I recall, the original upholstery was intact and looked reasonably good when the car was parked at the local Chevrolet-Oldsmobile-Cadillac dealership in the early 1990s. I wonder if the subsequent owners wore it out, or if the tobacco odor was so strong that the cloth interior had to go. If I only had the money to buy it! I can’t quite place where this car is located…it’s not along Route 11, is it? The car was located at a garage near the US Army Heritage and Education Center, near Route 11, but closer to I-81. Unfortunately, I can’t remember the exact street, and there was no phone number on the “For Sale” sign in closeup photos of the sign. I think that I got a phone number from someone in the garage, but lost it in the year between then and now. There was definitely no hint of tobacco odor in the car when I saw it, so the interior must have had a thorough cleaning as well as new upholstery. I remember the interior having new looking upholstery but a dashboard crack and pitting on metal fittings such as the door handles, and the exterior being either in great original condition or with a good older repaint. Sorry that I could not help more! Its location in this picture is Army Heritage Drive, down from the Sheetz on the corner of Army Heritage and Trindle Road, right down from the auto body shop before it curves left to cross over I-81. I’ll go and take a look today to see if it’s still there. in 1965 my dad bought one of these, a black 62 iirc, for my 17 year old sister to drive to senior year of high school. she literally refused it, and would go without her own car for several months rather than drive the first car we had with power windows. it was then i realized i liked the idea of driving a loaded top of he line used car more than a new plainer much more common car. power windows were a good measure of what i considered a brougham factor of luxury, to also have power ven windows was really fancy. Robert, Thank you for the article, but having owned those Imperials I disagree with you completely; 64-66 were some of the most distinctive Imperials ever made. 1959 vs. 1964 is definitely a matter of taste, and I have feelings both ways. As a new car/daily driver, I definitely would have preferred the 1964, since it is a more coherent design without the 1959’s bizarre details. If I were to buy an Imperial of this generation as a classic car, however, I would “embrace the crazy” (as another commenter put it) and go for the 1959. I have an affection for the 62 LeBaron. As attractive as the Engel Imperial is and was, the shame was what was lost in the 1964 restyled, namely a unique Imperial identity. A derivative Continental with Chrysler engineering was fine, if that was what one was after, but not if one wanted a distinct luxury car was a bold, unabashed identity. When one considers the 1963 Imperial styling themes and starts sketching from there, incorporating a cleaner approach but retaining a good share of existing themes, one comes out with a design that still is uniquely Imperial and not at all derivative. Wish Chrysler styling had taken that approach. But Engel was going with a winning theme because that’s what he was hired to do. Given the choice of a ’59 or ’64 Imperial, I take the ’59 hands down. Over-the-top, yes; overwrought, yes………but not derivative…….or to a degree, blandly boring! I actually like these cars and own a 1965 Imperial. I’m in the process of restoring it right now and while I hope I have all the parts I need it sure was a job, and fun, locating them. About the only part I need right now is more money. Hey, lots of us like these, don’t read too much into the nitpicking. Would love to see some pics of your car. It does seem the interwebs are making old car fans a little too fussy. Each has its charms, even if it’s not what Commenter X would spend his make-believe money on. Hate to spoil the party, but I prefer the ’65 version of the Imperial. The transmission shifter was moved to the steering column and the front end received less of a Pontiac nose split. Also, the headlights were covered with a single glass lens which made the car unique. Past that point, the Imperial totally lost its focus as Chrysler was kicked around by never ending financial issues. Count me as a fan! I love Engel’s designs. In retrospect, theyre timeless if maybe a little behind the times in their own day. A clean simple look will ways stand the test of time vs chasing the fad of the day. For a big luxo barge, i would take a Engel Imperial over pretty much anything else. Gimme a 2 dr hardtop dumped low and mean on rocket spokes with straight pipes and in flat black with scallops or ghost flames! The droptops look great …hell even the 4 dr h/t isnt bad as quadslammers go. Im not seeing anything awkward in that C pillar at all. To my eye, these cars just gel perfectly and there isnt a bad line on them. That said, powder blue is just AWFUL, as colors go….and i love blue. Cobalt, electric, midnite, royal or true blue. But ugh not robins egg blue…BARF. I agree with the ‘dark colors on these’ set 100%. Either way, nice find! Its good to see classic mopar iron in such pristine condition ready to be enjoyed properly. Robert, your title sums up this car perfectly for me (and is a candidate for best phrase of the year!). The proportions are slightly off, some details seem a bit heavy-handed yet other details are under-done. But I don’t hate it, I nothing it. In contrast, I do like the ’59, but the ’62 is the Imperial year for me. I borrowed “I don’t hate you, I nothing you” from a line that I heard in a TV sitcom. It was “Scrubs,” I believe. I like big, baby blue cars. I actually consider this to be an improvement by Engel on the Continental. Love the Mark-ish back end. It’s almost like he borrowed from his ’61 and Iaccoca’s boys borrowed his revision back for the Mark III. I’m obviously a Lincoln fan, but I have always liked and appreciated these 64-66 Imperials – the 65 with the glass enclosed headlights I thought was particularly striking and better looking than the 64-65 Lincolns and Cadillacs. Unfortunately, you don’t see many of them in as good of shape as equivalent Lincolns/Cadillacs – they seem more prone to rust. I do remember reading an article once where a former Ford designer said that they did “that car” when Ellwood Engel was working there prior to moving to Chrysler. Huh, I know exactly where that car is. Do you live in Carlisle? Thanks for looking up the car. Commenter Geeber wants to know about it, and I am interested in hearing about it as well. I don’t live in Carlisle; I live in the Washington, DC area and spotted the Imperial while visiting the US Army Heritage and Education Center. I take it that you are with the Air Force, from your name, assigned to the Army War College currently. No, I live in Carlisle. I did 12 years with the 193rd Special Operations Wing in Harrisburg before I threw my career away by diving into a bottle. It’s more a legacy name than anything else. So I went and checked, and it wasn’t there, but the well-worn 1983 Ford Fairmont Futura in the background of your shots (I got a few pictures myself) was still there going for $1750. Then the owner came out and asked me if I was interested in buying the Futura. I demurred, but asked about the Chrysler. He said that yes, he still has it, but it’s in the garage for the winter. I also told him about this website, so perhaps he’ll show up here in the near future. If you want it, he said, it’s still for sale. Thanks for checking on this Imperial. I live in Mechanicsburg, and work part-time at the Carlisle car shows. I have a good idea of where this place is. I’ll have to check it out when I’m in Carlisle tomorrow night. Looking at the photos again, I’m really impressed with the fit, finish and panel gaps for an early Sixties car. I know Ford resisted floating hoods for years because of those issue, look like Chrysler had no problems.